Harry Patch, ‘the last Tommy’ was stationed in the Salient and whilst manning a Lewis gun at Passchendaele he lost many of his pals. Harry’s last visit to Ypres was a few years before his death in 2009. 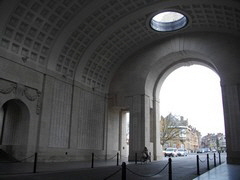 He passed one final time under the Menin Gate, the impressive monument that signifies the suffering and sacrifices in and around the Ypres Salient. Seeing the Menin Gate for myself, with the 55,000 names of the dead inscribed all over it was extremely moving. Just standing there quietly is enough to be moved to tears. It is even more emotional during the ‘Last Post’ ceremony that takes place there at 8pm every single evening. ‘We shall remember them’ is a reality here: the place relives its war past on a daily basis, in respect as well as in the spirit of reconciliation. The Royal British Legion plays an important role here in these daily ceremonies. Different groups bring wreaths of poppies to lay on the steps and there is always a variation in the proceedings.